Friday March 1st 1895 It was a windy disagreeable day. I baked cake and helped Will fix the meat to smoke. I did some sweeping and cleaned the kitchen a little in the afternoon. Will went to town in the afternoon. I read all the evening. I dressed a turkey. Saturday March 2nd 1895 I did up my work and got early dinner. Elmer and Ida Anderson come about ten oclock and the boys went on to town. Us girls had a good visit. I churned before supper and read in the evening. David went to town to stay all night. 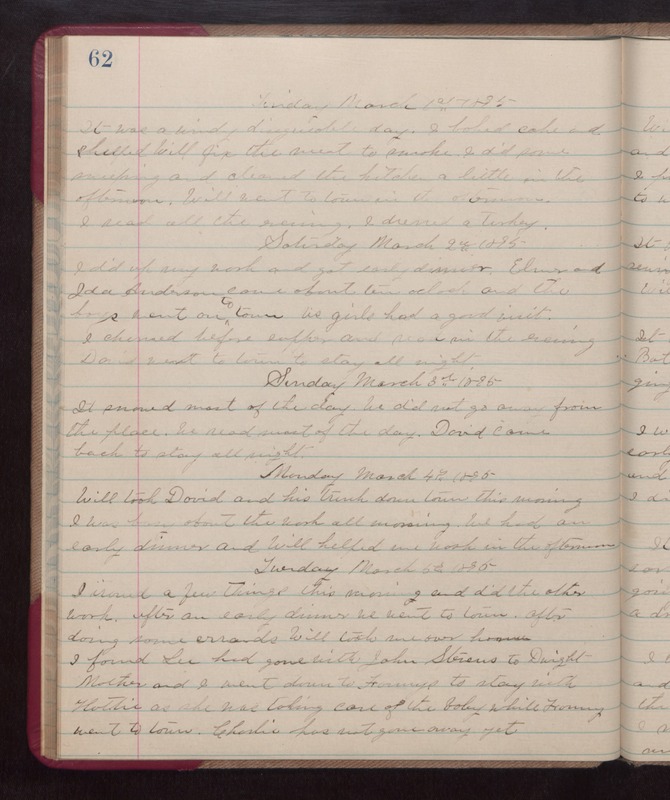 Sunday March 3rd 1895 Will took David and his trunk down town this morning. I was busy about the work all morning. We had an early dinner and Will helped me work in the afternoon. Tuesday March 5th 1895 I ironed a few things this morning and did the other work. After an early dinner we went to town. After doing some errands Will took me over home. I found Lee had gone with John Steves to Dwight. Mother and I went down to Fannys to stay with Hattie as she was taking care of the baby while Fanny went to town. Charlie has not gone away yet.